I've been less and less using in real time outfit of the days on Instagram and in this blog due to wanting to enjoy the events I'm at, not worry about weather and bad lighting, and just wanting to love my closet without needing to "need" to wear stuff so it gets photographed. That said, sometimes I still do get a real time #ootd and here are some the recent ones that I've gotten recently! I wore this on a day that was finally a sunny day, but it started out kind of chilly after a few days streak of cold and rainy days. It definitely felt like spring here, but I am glad I bundled up slightly with a light but long sleeved shirt. Because the shirt has sheer polka dots, I suppose you could technically consider this to be mixing prints! I got complimented a lot on this outfit, which I attribute to it all being tied together with accents of white making the whole outfit POP. This was taken on a summery day at the tail end of April. I decided to try mixing prints with shoes-a first for me-by mixing my Bernie Dexter barbecue print dress (hey summer!) with my Ralph Lauren zebra striped wedges. This was a fun look because it was screaming of summer...something that I am more than ready for!! Sorry...these next few outfit photos have terrible lighting...ugh. I totally had the chance to photograph this outfit in better lighting, but I totally forgot! I got this Folter/Retrolicious dress on Black Friday but have scarcely worn it because it was the dead of winter. 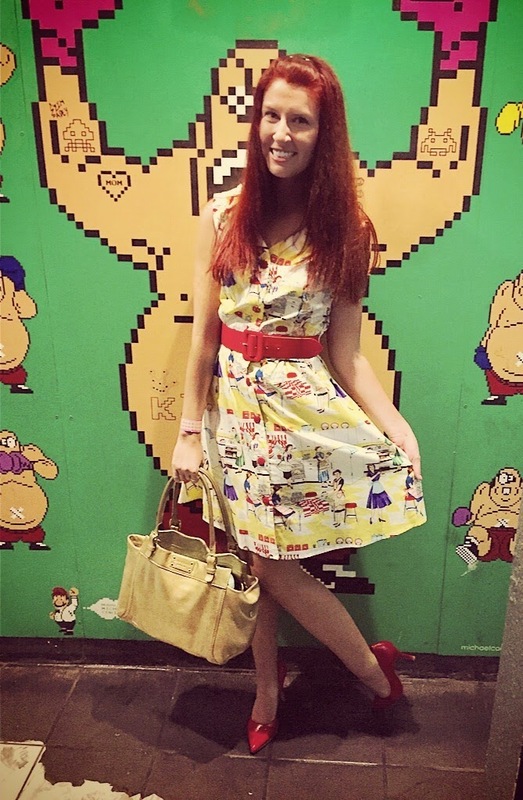 I'm excited to wear more Retrolicious dresses soon because they're such good summer dresses! I paired it with my red Nine West shoes and gold Kate Spade bag for a luke warm night out in early May. My Instagram friends may recognize my friend Katie here! This was also taken on the first weekend of May. Earlier in the day we were at a fundraiser for her son's heart surgery thrown by an organization we're both members of. Later in the day, we met up with some gal pals for dinner and this is when this photo was taken. 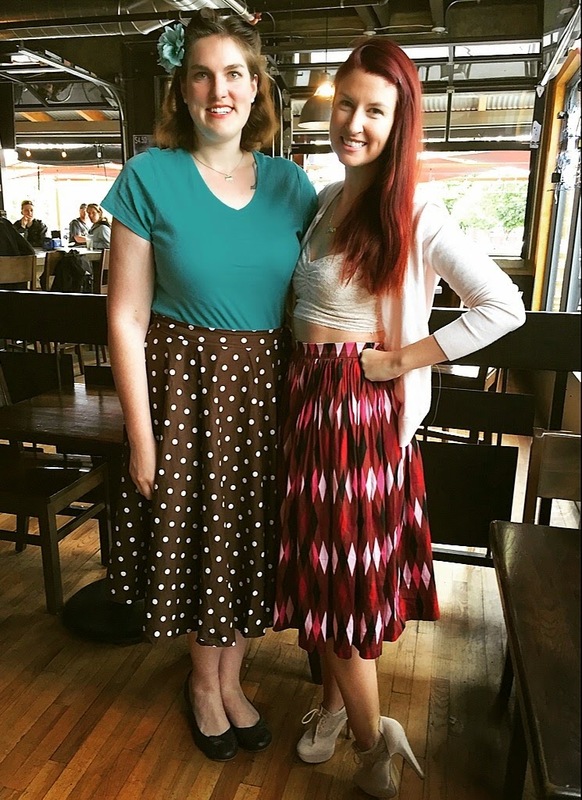 My friend Jeanice had never met Katie up until this point, but she knew she was my friend when she walked through the doors of the restaurant, wearing you know...polka dots, a circle skirt, and hair flower. Hahaha. I LOVE having a real life friend who dresses like me because I don't get to experience that too often. So this was a special #ootd, especially since we've spaced on getting a dual outfit photo EVERY single time we've hung out!! I forget how much I hate spring in Denver! It's windy and it rains way more often than I ever remember it doing. One of my favorite people's birthdays was this night and I decided I was still going to dress up despite the bad weather we were experiencing. I had literally just gotten this Romwe skirt in the mail, which helped me decide on what to wear because I really was anxious to wear this outfit. I actually had a matching Kate Spade (seen below) green purse that I forgot to take out of the car with me when I posed for this photo really fast (my friend was sitting in the front seat of my car and I stepped out with the umbrella before we lost light haha). 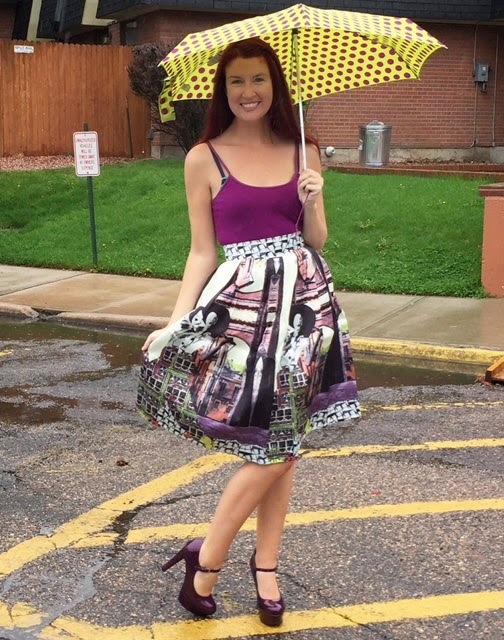 But as I've mentioned a few times, purple and green are my favorite colors so I had a lot of fun styling this with my purple Mary Jane pumps from G by Guess and Forever 21 tanks, polka dot umbrella from...I actually don't remember where, and in theory my Kate Spade bag! Still hating the rain here! Seriously...it's been raining every single day the past week or two! This was taken last week on a girl's night out, and I had just about had it up to here with this wet weather. I've worn pants a few times lately and a maxi skirt here and there but I was in no mood to completely cover up this night. I had been wanting to wear dress shorts a few times lately, and after looking at the weather forecast and saw that the temperature was likely not going to be dropping past 50 last night I decided that last night was as good as any to wear shorts. My compromise was to wear a sweater though, in which I opted for my kelly green one from Old Navy because this dreary weather needed a pop of color. Usually I wear white or black with these Banana Republic safari shorts, but I decided hell to the no on that one yesterday. Rounding it out I chose my Kate Spade bag and Nine West shoes to tie together all of the green. I also picked my ModCloth elephant necklace, which was funny because as a friend pointed out last night it matched my Safari shorts. I honestly just grabbed the first gold necklace I found in my (needs to be organized) jewelry box and walked out the door without thinking about how it synced up! Just when you think you have your A game mastered too...whoops! Beautiful outfits! I absolutely love that red skirt that you paired with the white crop top! Haha, thanks! Hooray for pops of color, right? Thank-you! I will for sure check it out! Hi lovely, great look and I love your smile!!! Have an amazing week. That top skirt just killed me! These are lovely! My favorite is the top one with that pretty skirt and the pops of white. Great post! I love how polished you always look! You have such a fantastic style sense. I do love the purple outfit with these gorgeous heels and this amazing skirt you have on here. Also, the polka dot umbrella goes perfectly with it for the weather you have been having. You are even stylish in the rain! 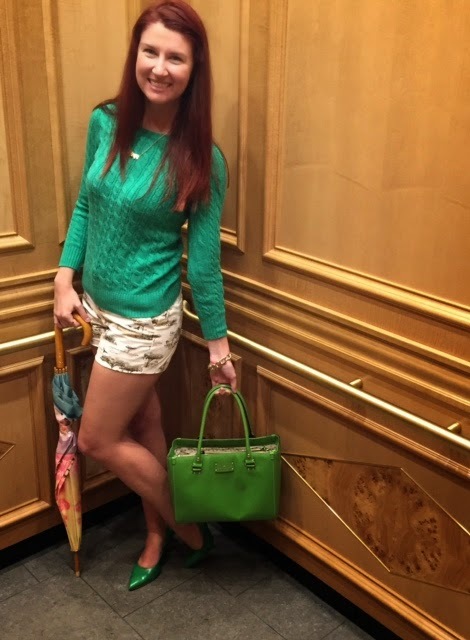 The green bag, shoes and sweater are a close second favorite for me. You look amazing in this color Lauren!